Our MSW Division manufactures Decentralized as well as Centralized MSW Composting plants from100 kg/day to 2000 tons/day and Waste shredders up to 100 tons/day capacity. Alfa Therm composting machines are used to effectively dispose off organic wastes (food waste and similar biodegradable wastes) in Vegetable and Fruit markets, Corporate canteens, Hotels and resorts, Restaurants, Theme parks and stadiums, Hospital, school, Colleges and Military canteens, Mess, Railway stations, Highway service centers, Airports, Manufacturing facilities for foods, Supermarkets and food distribution centers, Municipal Councils and corporations, Group Housing societies etc. 3. Inbuilt shredding of waste and mixing of waste. 5. 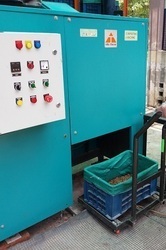 Shifting of processed waste from machine through trolley to the curing system. 6. Placement of crate into curing system for 10 days. 7. 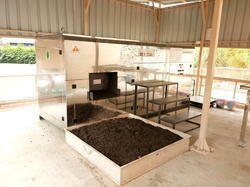 Ready compost in curing system after 10 days. 8. Use of compost in-house garden/kitchen or packing for sale. The compost 24 is most advanced composting machine that converts food waste into compost in just 24 hours. There is no need of a separate curing system in this model. This model has inbuilt shredder and is well equipped with moisture reduction system, odour control mechanism and is fully automatic operation. ·Processes all types of organic waste (Canteen Waste, Kitchen Waste and garden Waste). · Volume reduction of organic waste into high quality compost. · In-house waste management reducing dependence on any outside agency.